The November 2011 Monthly Checklist winners have been announced and the prizes have been rewarded. Congratulations to all of those who have won. Don't forget, this is a monthly permanent feature that you can enter for FREE. If you haven't already, you should enter the December event! The Lottery has been drawn for this week. guesswhomewmeow is the winner of the 99,000MP Jackpot with the winning numbers of 2, 23, 19, 15, 1 and 6! Congratulations! Last Week's Raffle has now ended. wintercat23 is the winner of the Red DNA and 100,000MP prize with the winning raffle ticket number 531! Congratulations! Make sure you buy your tickets for today's raffle - only 10MP per ticket! A new Native Account Upgrade has just been released. You will receive a native themed cd, book, dvd, potato, costume, stamp, minipet and either a native coloured Tasi or Knutt Potion. The Tasi pet will never be avaliable in any Account Upgrades again. With the United States to soon be celebrating Thanksgiving, we have a random, one time Turkey Hunt. This event will end on December 1st. As you browse and play the site as normal, check every page for a Turkey item in a box. When you find one click it. The 250 different players who collect the most turkey items will receive 1,000,000MP and a limited edition Gargoyle Trading Card! The next 250 will just get a Gargoyle Trading Card. 25 lucky players who have collected more than 100 turkey items will also be randomly selected to win a random Gobble Potion! WARNING : Anyone caught adding fake Turkey items to their profile, signatures, clubs or anywhere else on the site will have their account frozen for the rest of the event and be fined for doing so. The October 2011 Monthly Checklist winners have been announced and the prizes have been rewarded. Congratulations to all of those who have won. Don't forget, this is a monthly permanent feature that you can enter for FREE. If you haven't already, you should enter the November event! The Lottery has been drawn for this week. Roxy4Ever118 is the winner of the 93,300MP Jackpot with the winning numbers of 21, 22, 25, 7, 10 and 11! Congratulations! Last Week's Raffle has now ended. XxEzkandarxX is the winner of the Red DNA and 100,000MP prize with the winning raffle ticket number 2533! Congratulations! Make sure you buy your tickets for today's raffle - only 10MP per ticket! The Lottery has been drawn for this week. Chiame is the winner of the 62,300MP Jackpot with the winning numbers of 5, 7, 10, 13, 18 and 25! Congratulations! Last Week's Raffle has now ended. twilightHP is the winner of the Red DNA and 100,000MP prize with the winning raffle ticket number 654! Congratulations! Make sure you buy your tickets for today's raffle - only 10MP per ticket! The Lottery has been drawn for this week. britward6 is the winner of the 160,800MP Jackpot with the winning numbers of 6, 9, 21, 25, 8 and 17! Congratulations! Last Week's Raffle has now ended. wazupdil2252 is the winner of the Red DNA and 100,000MP prize with the winning raffle ticket number 393! Congratulations! Make sure you buy your tickets for today's raffle - only 10MP per ticket! The Lottery has been drawn for this week. hibah02 is the winner of the 246,300MP Jackpot with the winning numbers of 1, 25, 16, 7, 4 and 10! Congratulations! Last Week's Raffle has now ended. brownskin98 is the winner of the Red DNA and 100,000MP prize with the winning raffle ticket number 1958! Congratulations! Make sure you buy your tickets for today's raffle - only 10MP per ticket! The Lottery has been drawn for this week. thekrawk is the winner of the 60,000MP Jackpot with the winning numbers of 14, 2, 8, 3, 22 and 24! Congratulations! Last Week's Raffle has now ended. goodgirlslikebadboys is the winner of the Red DNA and 100,000MP prize with the winning raffle ticket number 686! Congratulations! Make sure you buy your tickets for today's raffle - only 10MP per ticket! Its time to celebrate Halloween in the world of Undying Woods! Elger has taken the time off from doing quests during this holiday season. 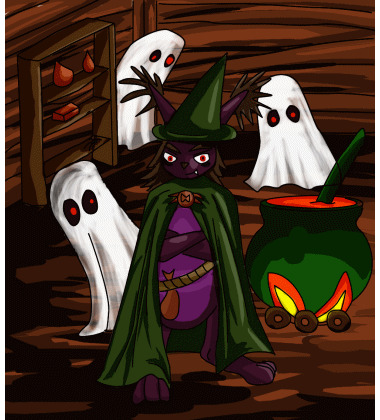 Instead, you can visit her with your pet dressed up for Halloween to go Trick or Treating for FREE once every 20 minutes - Mad Scientist pets can visit once every 15 minutes! All you need to take part is a pet wearing a Halloween, Nefarious, Skeleton, Ghost, Witch, Dark, Zombie, Wizard, Voodoo, Vampire, Goblin, Rotten, Midnight, Insideout, Gothic, Eleka, Killer, Mad Scientist, Werewolf or Devil costume! The Lottery has been drawn for this week. TheMovieStar is the winner of the 82,000MP Jackpot with the winning numbers of 1, 3, 5, 9, 7 and 21! Congratulations! Last Week's Raffle has now ended. Moontype is the winner of the Red DNA and 100,000MP prize with the winning raffle ticket number 2194! Congratulations! Make sure you buy your tickets for today's raffle - only 10MP per ticket! The Lottery has been drawn for this week. whineygirl is the winner of the 59,300MP Jackpot with the winning numbers of 1, 2, 5, 7, 13 and 25! Congratulations! Last Week's Raffle has now ended. carlossantllan is the winner of the Red DNA and 100,000MP prize with the winning raffle ticket number 2232! Congratulations! Make sure you buy your tickets for today's raffle - only 10MP per ticket! With the recession now over we can all afford to waste food items!! Throw a food item at any player on the site and if it randomly manages to hit them you will win a prize! You can throw an item by using Send Item. The September 2011 Monthly Checklist winners have been announced and the prizes have been rewarded. Congratulations to all of those who have won. Don't forget, this is a monthly permanent feature that you can enter for FREE. If you haven't already, you should enter the May event! The Ice Fairy Mystery Item Game is back! Can you guess what Marapets Item is? The Lottery has been drawn for this week. SnowPrince is the winner of the 63,900MP Jackpot with the winning numbers of 20, 22, 18, 13, 2 and 8! Congratulations! Last Week's Raffle has now ended. tineewolf is the winner of the Red DNA and 100,000MP prize with the winning raffle ticket number 4759! Congratulations! Make sure you buy your tickets for today's raffle - only 10MP per ticket! The Lottery has been drawn for this week. sirwolfy is the winner of the 69,800MP Jackpot with the winning numbers of 1, 3, 5, 7, 9 and 11! Congratulations! Last Week's Raffle has now ended. Tsukio is the winner of the Red DNA and 100,000MP prize with the winning raffle ticket number 2249! Congratulations! Make sure you buy your tickets for today's raffle - only 10MP per ticket! The Lottery has been drawn for this week. ruby123451353 is the winner of the 49,800MP Jackpot with the winning numbers of 6, 5, 4, 3, 2 and 1! Congratulations! Last Week's Raffle has now ended. ann222 is the winner of the Red DNA and 100,000MP prize with the winning raffle ticket number 1211! Congratulations! Make sure you buy your tickets for today's raffle - only 10MP per ticket! The Lottery has been drawn for this week. novasupercool is the winner of the 75,900MP Jackpot with the winning numbers of 3, 24, 12, 5, 23 and 10! Congratulations! Last Week's Raffle has now ended. tigger68au is the winner of the Red DNA and 100,000MP prize with the winning raffle ticket number 539! Congratulations! Make sure you buy your tickets for today's raffle - only 10MP per ticket!